EXXARO Resources has granted Tronox the option of buying the remaining 24% stake it intends to sell in the New York-listed mineral sands producer. 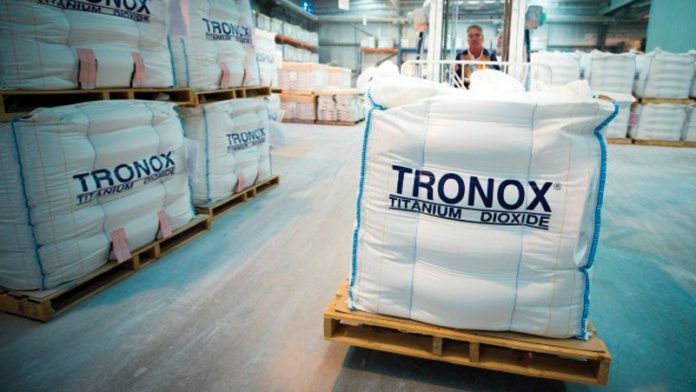 The agreement is one of several which also includes Exxaro’s support for the redomiciling of Tronox to the UK from its current Australian base. Tronox said in a statement today that one of the reasons for changing address was to make it easier to buy its own shares. The two companies have also agreed to reciprocal share tax sharing arrangements in the event of a profit or loss related capital gains. This may occur as a result of changes Tronox must make to its structure in order to move its headquarters to the UK. In 2017, Exxaro sold 22.42 million Tronox shares equal to approximately 19% of Tronox’s total outstanding voting shares in issue for about R6.55bn. It still, however, has 24% in the firm which it said earlier this year it intended to sell. Exxaro said today it hoped the sale would be complete in the first half of 2019 and that the process would be conducted in an orderly fashion. Exxaro decided to sell its shares in Tronox following the latter’s merger with a peer which incurred debt to which the JSE-listed firm did not want exposure. Another aspect of today’s agreement is that Tronox is to accelerate the repurchase of Exxaro’s 26% ownership interest in a Tronox UK subsidiary, which holds loans made to Tronox’s two South African subsidiaries that were made prior to the 2012 acquisition. These agreements are largely an effort to resolve legacy issues ahead of Exxaro becoming 100% focused on its coal and future energy and sustainability business, the details of which are yet to be disclosed but could involve more investment in renewable energy and the utilisation of land and property it owns. Said Exxaro: “The transactions provide Exxaro with greater certainty regarding the process and timing for Exxaro’s monetisation of its interest in Tronox and its English and South African subsidiaries, whilst supporting Tronox’s intention to effect the redomicile and manage Exxaro’s exit in an efficient way. “Any proceeds from the transactions will be utilised in core activities, to fund capital commitments, to repay debt and to make distributions to shareholders”. Riaan Koppeschaar, Exxaro financial director, said in August that the sale of the remainder of Tronox, which is currently worth about $321.6m or R4.4bn, would be paid back to shareholders. This is less, though that the $530m or R7.7bn at which the stake was valued when Koppeschaar made these comments. Exxaro is due to publish its finance director’s pre-financial year close commentary on Wednesday, November 28.